Illustration by Keith Rankin for Bloomberg Businessweek. (Bloomberg Businessweek) -- Imagine a business in which the worst performers are among the highest-paid employees. And imagine that top performers’ talents start to fade soon after their salaries soar. This is what it’s like for Major League Baseball owners who are trying to profit, or at least not bleed money, in a labor market that makes little sense in any other context. In the past 15 years, no group of players has seen a bigger increase in salary share than the league’s worst, while no group has seen its share decline faster than the best. Before shedding tears for team owners, consider the situation players face. The league’s labor agreement is built around a rigid seniority system: In their first six years, players can negotiate only with the team they’re on. After that, they can test free agency. 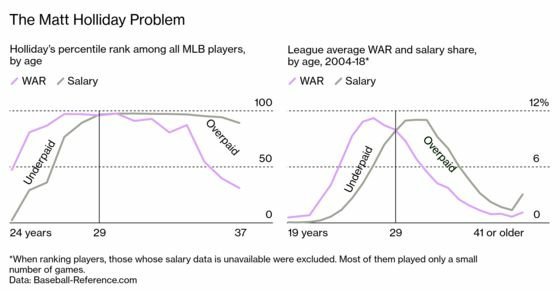 The upshot is that players are generally underpaid while they’re young but, if they’re good enough, can make up the losses later in their career. It’s an arrangement that’s kept the $10 billion enterprise stable for decades. But this winter the system shows serious signs of strain. Owners are increasingly reluctant to pay for past performance, and players aren’t happy about that. The two most talented free agents, Manny Machado and Bryce Harper, sat unsigned for months before striking a deal with the San Diego Padres and the Philadelphia Phillies, respectively. Their contracts were record-breaking—but many others, some coming off career years, settled for significantly less than projected, leading high-profile players to speak out. The “system is broken,” tweeted seven-time All-Star Justin Verlander, a Houston Astros pitcher who could be a free agent a year from now. “It’s obviously not good for baseball,” Mike Trout, the game’s best player, told reporters in February. The acrimony will likely fade with the arrival of Opening Day on March 28 as the focus turns to winning games, but it will eventually grow louder as the two sides approach the end of their current five-year labor deal in 2021. When players gained free agency in the 1970s—a landmark moment in sports history—the MLB Players Association became one of the nation’s strongest unions. Forty years later, “the balance is shifting back toward owners,” says Joel Maxcy, a sports economist at Drexel University in Philadelphia. Baseball’s labor market is different from those of the National Football League or the National Basketball Association. There’s no strict payroll ceiling or floor, which makes it the only U.S. league in which owners bid for players in an open market. But there are rules: During their first three years most players make the league minimum, about $550,000. After the third year players and their teams can negotiate a new salary; if a player doesn’t like what his team offers, he can go before a panel of arbitrators to explain why his pay should be higher. After six years a player can become a free agent. Since 2006, the share of league revenue paid to players has ranged from 54 percent to 58 percent. In February right fielder Harper landed a 13-year, $330 million deal from the Phillies, and third baseman Machado got 10 years and $300 million from the Padres. But owners are increasingly reluctant to offer such long and rich contracts. To see why, consider 39-year-old left fielder Matt Holliday, a seven-time All-Star who spent his prime as one of baseball’s best hitters. On the back end of his career, he continued collecting a $17 million annual salary as his performance fell sharply. The Colorado Rockies drafted Holliday in 1998, and he made his big-league debut in 2004 at age 24. By his third season he was an All-Star and a fantastic bargain at $500,000. In his fourth he led the National League in hits, runs batted in, and batting average and helped the Rockies to the club’s only World Series appearance. That off-season, with two more years until free agency, he was rewarded with a two-year, $23 million extension to avoid arbitration. After the 2009 season, Holliday became a free agent and entered the brief phase of his career when pay matched performance. Just before his 30th birthday, he signed a seven-year, $120 million contract with the St. Louis Cardinals. In the first three years of that deal, Holliday was the slugger the Cardinals paid for, helping the team win a World Series in 2011. But by the end of the agreement in 2016, he was one of the game’s most overpaid players. The league Holliday joined in the mid-2000s is very different from today’s. The use of advanced statistics in player evaluation, promoted as revolutionary in the 2003 best-seller Moneyball, is now standard practice. 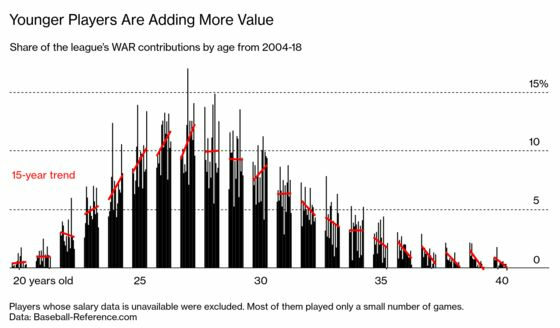 In the age of analytics, younger players contribute much more, at least according to the wonks’ preferred metric: WAR, for “wins above replacement.” WAR boils all of a player’s contributions into a single, management-friendly number. How many more wins can you get over the course of a season by playing this guy instead of some easily hired replacement? WAR is supposed to be the answer, and increasingly teams get WAR from younger players. The league says this youth movement reflects a change in performance as players age. Stringent testing and severe penalties have reduced the use of career-extending steroids. “Players decline more quickly than they did in the past,” MLB Deputy Commissioner Dan Halem says. “That’s a trend that our clubs are reacting to.” This shift can also be self-reinforcing: If owners pack rosters with young (and cheap) players, they’ll of course count for more production. Here’s a stat Longoria might not want to read: The worst player in the league last year as measured by WAR, Chris Davis, was also one of the 20 highest-paid. He has plenty of company: The bottom of the WAR chart is littered with former All-Stars finishing long-term deals. The poster boys for baseball’s newly cost-conscious labor market are Vladimir Guerrero Jr. and Mike Moustakas. Guerrero, an outrageously talented 19-year-old third baseman for the Toronto Blue Jays, will likely start this season in the minor leagues, so the Blue Jays don’t have to start the clock on his six years before free agency. League rules dictate that a mere 15 days in the minors is enough to delay free agency for an entire season. That means the Blue Jays will live without him for a couple of weeks now to get another cheap season of production when he’s in his prime. The 30-year-old slugger Moustakas is at the other end of the curve. After setting the Kansas City Royals’ single-season home run record with 38 in 2017, the third baseman entered free agency confident he’d land a multiyear, Holliday-style deal. Those offers never came. He took a one-year, $6.5 million deal to return to the Royals, who traded him to the Milwaukee Brewers last July. A free agent again this off-season after a productive year, he knew what to expect. In February, he signed another one-year, $10 million contract with the Brewers.